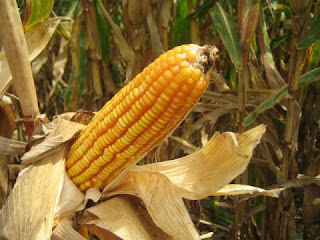 Corn cobs offer yet another source of farm materials suitable for ethanol production. In a harvest event last week, Darrin Ihnen's farm near Hurley, South Dakota was the site of a demonstration of harvesting techniques for collecting the cobs. Poet, a long-time ethanol producer, is working with farmers like Ihnen and equipment manufacturers on the process to harvest, store and transport the cobs to ethanol plants as a source for producing the alternative fuel. Poet plans to expand its 50 million gallon per-year facility in Emmetsburg, Iowa, to produce 125 million gallons per year -- 25 percent of them from corn cobs and fiber. 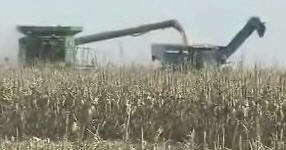 The local CBS affiliate has a video of the harvest available online HERE. Harvesting more than just the kernels of corn represents some big changes. That's why the demonstration project brought the ethanol producer, farm equipment manufacturers and the farmers together to look at how to harvest the cobs. Others are also looking at the same issue. In this report from the Des Moines Register, researchers are also looking at ways to harvest more from the field. "Finding a way to economically supply cellulosic biomass crops - such as cornstalks and cobs, prairie grasses or wheat straw - to the next generation of bio- refineries will be a critical first step in the evolution of the ethanol industry." As the ethanol industry matures, new and innovative sources for materials need to be developed. That's why some suggest that stopping corn ethanol will kill off any future development of cellulosic ethanol. Which is probably why corn has become the primary target of Big Oil. If corn ethanol is stopped, the entire industry is defeated. Why Don't They Care About $3.00 Gas Anymore? Senator Lugar Names "Energy Patriots"